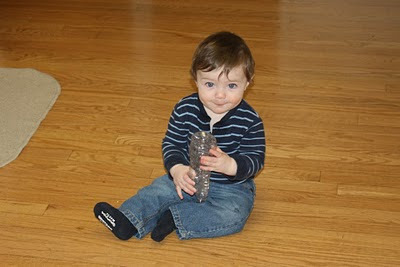 Zach, my grandson, is now nine months old and he is in that “getting into everything “ stage. He is crawling around and grabbing onto handles of drawers and cabinets. He isn’t walking but is taking a couple steps cruising. Real cruising can’t be far away. 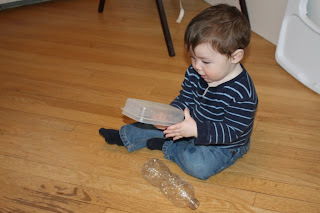 He likes to pull out all the plastic containers from the one cabinet we try to steer him too. Forget bothering with organization in that cabinet for the forseeable future. As Zach reaches each new stage – that seems like every few weeks – the parents and grandparents have to make adjustments. Zach used to be satisfied to stay in his high chair on wheels and observe Mom for awhile during the day. She would move the chair from room to room to get some things done and he would play and interact with her just fine. Now that he can crawl, being happy to sit in this chair is a thing of the past. Here at the grandparents’ house, we are getting ready to implement some changes ourselves. There are more safety plugs in the outlets. I must admit I hate having to do this in my much used outlets but Zach particularly is interested in the one on the side of my counter that I plug a mixer into and so it was the first one to get the safety treatment. 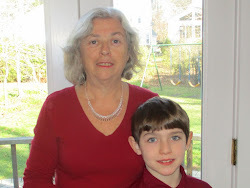 Zach’s safety comes before Grandma’s convenience – no contest!. On our list of safety steps is a gate from the kitchen to the basement and safety lock for the under the sink cabinet. My sister-in-law plans to bring us her safety gate since her grandchildren are all older now and so we will once again benefit from handy-me-down supplies. Enjoying life’s simple pleasures is really amplified with Zach around. Watching Zach grow and change continually is both enjoyable and stimulating for us. Soon I plan to write about Zach’s eating habits and gourmet menu. Check back soon for that post. I hope you’ll share your grandparenting experience with little ones in the comments. As Zach's mother I can definitely say things are different. He's what I call pre-toddler. He eats like a toddler and plays like a toddler, meaning, he doesn't want to stop exploring to eat so we feed him Gerber Graduates Puffs as a snack while he plays and have discovered his focus at mealtime is no longer my home made baby food but the next thing to play with. My baby is growing up too fast!!! He has fun exploring our house and grandma's house and is always happy to see Grandma and Pop! Zach is a real cutie! It sounds as if he is keeping you all busy! (BTW, Mauigirl is my blog name).